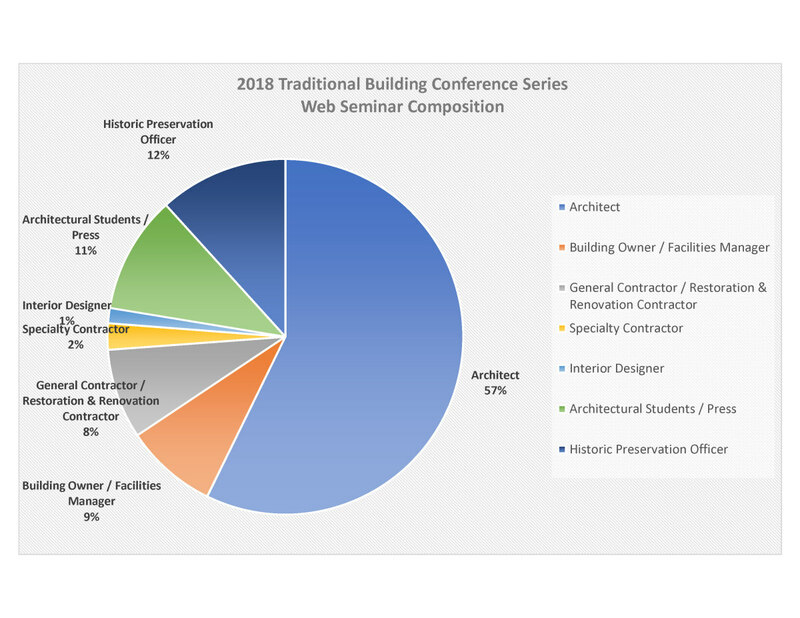 If you sell products and services for the historic preservation, restoration, renovation and traditionally inspired new construction markets, you’ll want to participate in the Traditional Building Conference Series 2019. 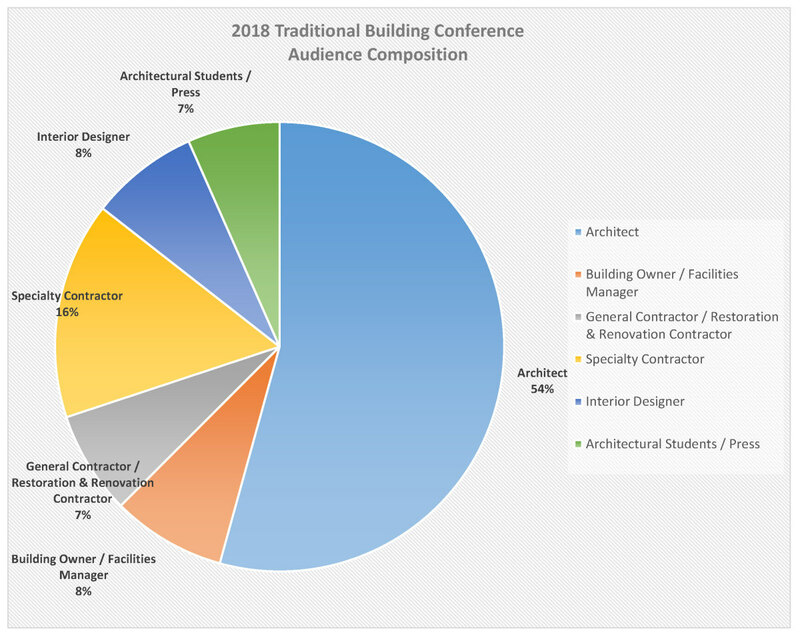 As a Sponsor of the Traditional Building Conference Series, you will connect with architects, contractors, building owners, and facilities managers, in person, in print, and online. All of our conferences take place in beautiful historic venues. In between educational, AIA-accredited seminars, attendees network with the speakers and sponsors. There are up to twenty sponsors, as space permits. Current sponsors include the leading manufacturers and service providers who sell the $170 billion traditional building market. The Traditional Building Conferences are not trade shows but a personal, relaxed setting for having meaningful conversations with your clients and prospects. You'll meet buyers and specifiers you would not normally have access to. An invitation to present a seminar or to do “Traditional Takes” at one in-person event in 2019. Priority status to present one LIVE webinar. There will be at least 9 web seminars for AIA credit in 2019. Platinum Partners will receive list of registrants for both live and on-demand webinars (estimated 1,000 sales leads). Full year recognition as a TBCS Platinum Partner on all printed and digital material. Links from TBCS promotions to your web site…all year long. Your company profile on TBCS web site. 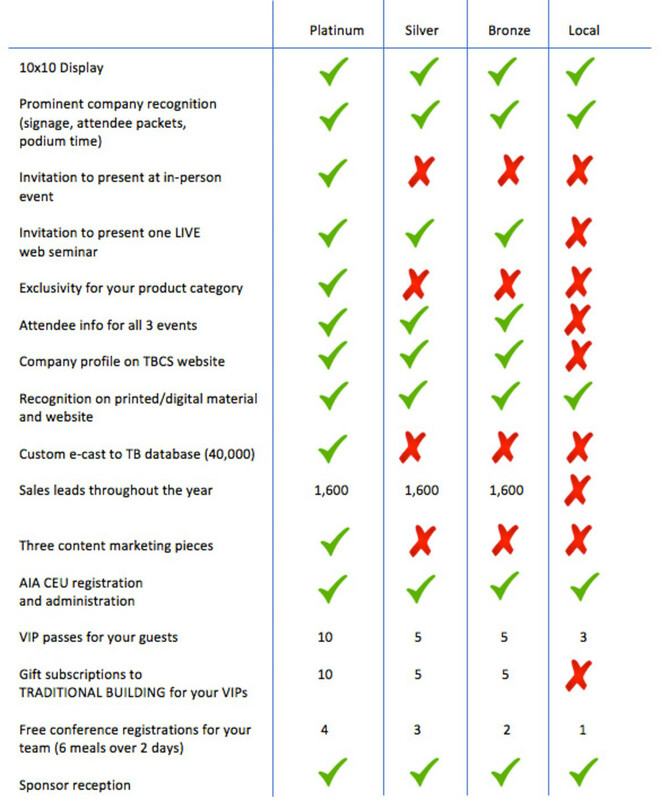 Platinum Partner exclusivity in your product category. One Platinum Partner e cast to TB database (40,000). 1,600 TBCS sales leads throughout the year. Three content marketing pieces to the TBCS audience throughout the year via web, email, and social media. 10 VIP passes for your guests. 10 gift subscriptions to TRADITIONAL BUILDING for your VIPs. 1 sponsor reception and 1 networking dinner. A seat at the Palladio Awards gala in July 2019. A 10x10 Display in all three (3) TBCS in-person events 2019. List of attendees with contact info for all three in-person events (estimated 600 sales leads). An invitation to present one LIVE web seminar. List of all web seminar registrants both LIVE and on-demand for at least 9 web seminars offering AIA Learning Units in 2019 (estimated 1,000 sales leads). Full year recognition as a TBCS Silver Partner on all print and digital material. 1,600 sales leads throughout the year. 5 VIP passes for your guests. 5 gift subscriptions to TRADITIONAL BUILDING for your VIPs. 3 conference registrations for your team, includes meals. Your company recognition during the conference (signage and attendee packets). An invitation to present one LIVE web seminar for AIA Learning Units. Must meet AIA course requirements. List of all your LIVE and on-demand web seminar attendees (estimated 100 sales leads). Full year recognition as a TBCS Bronze Partner on all print and digital material. AIA registration and administration for all conference and online education. 2 conference registrations for your team includes meals. A 10x10 display in one (1) in-person event 2019. Your company recognition during the conference (signage, attendee packets). List of attendees with contact info. Full year recognition as a TBCS sponsor with links from TBCS web site to your web site. 3 VIP passes for your guests. For companies who are not part of a Traditional Building Conference Series program outlined above the education fee for one webinar and Lunch and Learn will be $6,750. Additional charges may apply for Continuing Education Credit from additional providers (over and above the American Institute of Architects). Prepare seminar title, AIA learning objectives and course description. Develop power point presentation (w client) including the sourcing of images. Writes the exam for the on-demand web seminar. Secures AIA approval for your course. Issue AIA Learning Unit certificates to all students who take your course and pass their exam. Maintains records for 6 years, per AIA “audit” requirements. Moderates your course LIVE. Advises marketing team on the promotion of your web seminar to TRADITIONAL BUILDING B2B audience.